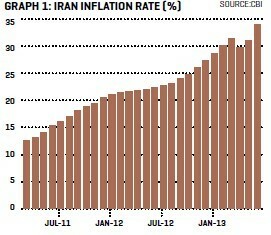 Iran’s official inflation rate climbed to 34% for the year ending with the Iranian month of Khordad on 21 June, according to Central Bank of Iran (CBI) figures. This is up from 31% a month earlier and well above the IMF’s predicted 27% figure for 2013. Unofficially the inflation rate could be double this, independent economists and analysts maintain (see graph 1).